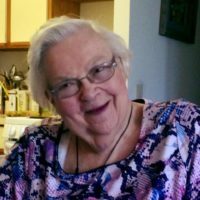 A Visitation for Carol June Cooper Cutler, of Palatine, will be from 10:00 AM until the time of the Memorial Service at 11:00 AM on Tuesday, February 12, 2019, at Christ Lutheran Church, 41 S. Rohlwing Rd, Palatine. Carol was born on December 13, 1928 and raised in Omaha, Nebraska, the daughter of Lumas Roy Cooper and June Cecelia Carlson Cutler. She had an older brother, Charles Lumas Cooper, who preceded her in death. She was a gregarious person with a deep love of family and her church. Carol had many friends, especially from church and most recent apartment in Palatine, IL, who happily celebrated her 90th birthday party with her and her family in December 2018. She met her future husband, Henry Collins Cutler, Jr in 1949 when they worked together at Swanson Foods. They married in 1951 and moved because of Henry’s job to Buffalo, NY where their two daughters were born. Their older daughter, Constance “Connie” June Cutler shared that her mom graduated from Omaha University, now part of the University of Nebraska, in 1951 with a degree in Sociology. After she and her young family moved to Cherry Hill, NJ, she went back to school and earned a degree in Early Childhood Education. After 10 years, they moved to her favorite home in Chester Springs, PA. Carol continued to teach for many years until she and her family moved back to the Midwest in 1976. She and Henry ran Cutler’s Café in Tekamah, NE for several years until they moved to Palatine, IL to live with Connie. After Henry’s death in 2000, she stayed with Connie’s family and loved helping her grandsons with their homework and attending after-school activities, especially Little League games, where she would “occasionally” yell at the umpire. She volunteered as a reading teacher at her grandsons’ elementary school, continuing to share her gift of teaching with many young people. Carol’s younger daughter, Kenna Marie Cutler Dougherty stayed in the Midwest but she and her daughter visited often so that Carol was able to see her granddaughter grow up and celebrate getting having her three beloved grandchildren together for family events. Carol had many interests and was constantly learning. She was blessed with a beautiful alto voice and sang in church choirs. She also played piano and organ but her passion was reading and sewing quilts, which she continued until her death from congestive heart failure in February 2019. She and her church friends made many quilts which were donated to Lutheran World Relief. Family was the most important thing in her life though. She delighted welcoming her great-grandson Henry, born in June 2018 and named after her husband. Carol died on February 8, 2019 and is survived by her two daughters, a granddaughter, two grandsons and a granddaughter-in-law, and a great-grandson. In lieu of flowers, Carol’s family requests donations are made to her church.